44 | March - April 2014 | www.machinerylubrication.com ML get tO k nOw Q: what types of training have you taken to get to your current position? A: I attended the machinery lubrication classes that are offered by Noria Corporation. I also have attended some conferences and exhibitions related to machinery lubrication. Q: what professional certifications have you attained? A: I have achieved the Machinery Lubrication Technician (MLT) Level I certiﬁcation from the International Council for Machinery Lubrication (ICML) and the Airborne Ultrasound Inspector Level I certiﬁcation from SDT. Q: Are you planning to obtain additional training or achieve higher certifications? A: I would like to get the Machine Lubricant Analysis (MLA) Level I certiﬁcation so I can better understand what the equipment is trying to tell me from the oil analysis results and visual inspections. Q: what's a normal work day like for you? A: I begin the day by performing mechanical room/air compressor checks. I then follow up with any corrective work orders found during my lube route. I also conduct daily visual checks on the vacuum pumps in our aluminum casting department and assist with various maintenance calls throughout the day. Q: what is the amount and range of equipment that you help service through lubrication/oil analysis tasks? A: We have 238 check items on 75 different pieces of equipment. They range from ﬁre-resistant ﬂuids in our casting process to CNC milling machines and aluminum painting equipment. 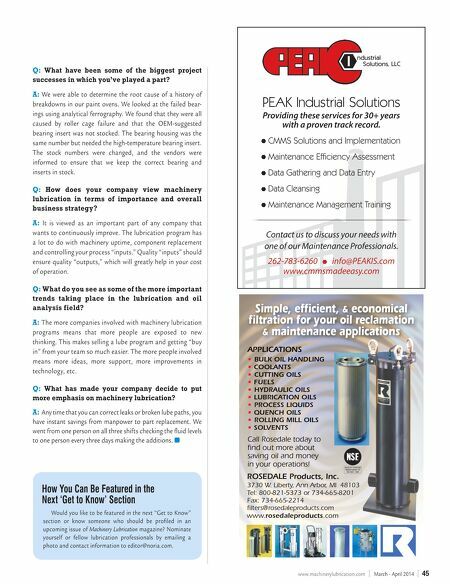 Q: what lubrication-related projects are you currently working on? A: We are investigating the possibility of changing our ﬁre-resistant vegetable-based ﬂuids to a ﬁre-resistant synthetic oil. The synthetic seems to be more stable over time and have lower maintenance needs. CMwa's durham sees Beneﬁts of solid lubrication Program When Frank Durham joined the predictive maintenance team at Central Motor Wheel of America (CMWA) six years ago, he helped the team investigate the requirements of a solid predictive program. They soon discovered that machinery lubrication is a critical part of any good program. In the years since, Durham and his team have measured results from each phase of the program and realized cost savings from oil consol- idation, storage and handling. Better lubricant usage tracking has also shown the team just how important a good lubrication program can be. Name: Frank Durham Age: 44 Title: Lubrication and Ultrasound Technician Years of Service: 10 years Company: Central Motor Wheel of America Location: Paris, Ky.